Join the discussion on our forums! Come discuss Genzo, the Shark over in our dedicated Genzo, the Shark discussion topic. 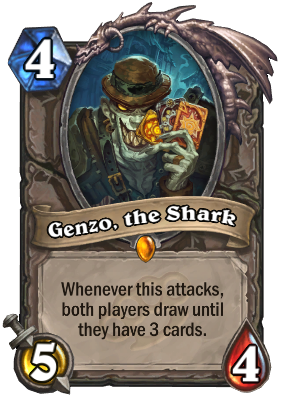 Infamous in the seedy underground card rooms of Gadgetzan, he got his nickname winning the coveted Shark Plushie in the city's first Hearthstone tournament. Trying to make Raza DK priest, got so happy when the orange glow appeared only for it to be this. Feelsbadman. I forgot this card existed. That would make it too overpowered in a mill deck. I'd like to think he'd have a place in an aggro deck, such as Pirate Warrior, but honestly, he's taking up a spot best used for another threat that can get you the extra points you need for lethal. Since he benefits both players, he can flip your superior board state into a disadvantage from which you won't recover. I just don't see a place for him in competitive Standard. Maybe something in Wild, or a future Tavern Brawl? this card is pretty good if you space out your threats. definitely weaker versus full hands like renos. extremely strong when both sides are running out of steam. definitely not a Dr. 4 cant be played as one. it is a punish when you expect that they are lacking removal. sometimes the opponent leaves it up, hoping to draw 1 card. you then can play 6 cards instead of a situation with only 3 in hand and he gets punished for greed. I think you don't understand how the card works. Is this a Jumanji situation, is he trapped in his own game? I really want him to be usable. Lower his stats and give him Charge or Stealth or something, because as is you're rarely ever gonna get to attack with him. If he had Stealth, I'd nerf his ability to "Whenever this minion attacks a hero" like Cutpurse so taunts could be a counterplay option, alongside AOE. That seems like a good balance for him. I got this card a while back but I disenchanted it. I got it again now and golden too. Should I craft me a legendary I need or not? In which decks does he fit? And so on ... I just mentioned all the worst of the set but worse than the Genzo has a lot more. Test the card first before you speak nonsense.